Window Cleaning A Classroom With A View! It’s hard not to be distracted by the magnificent view this prestigious private school building has which overlooks an Olympic sized pool and Brisbane city. What is really refreshing is that not only is there stunning views, a stunningly designed building but also we are pleasantly stunned by the thought that has gone into its ongoing maintenance. You will notice that there are purpose built window cleaning ledges, complete with safety anchors to allow window cleaning to be safely carried out. Needless to say this makes our job much easier. Get It Clean takes safety very seriously and we have an extensive training program to ensure that our professional cleaners do the very best job in the very safest way. We often find ourselves on a ledge somewhere overlooking great scenery in beautiful Brisbane and while that is just one of the perks of our job we LOVE the fact that our work means that our client can also enjoy beautiful Brisbane at its crystal clear best long after we are gone! Please call us on 3268 4246 to see what we can do for your view. We’d be happy to help. https://getitclean.com.au/wp-content/uploads/2015/03/Commercial-Window-Cleaning-e1425268126595.jpg 506 900 Get It Clean https://getitclean.com.au/wp-content/uploads/2013/07/get-it-clean-logo.png Get It Clean2015-02-07 10:51:532015-03-02 03:54:58Window Cleaning A Classroom With A View! 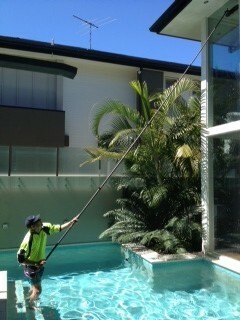 Tricky Window Cleaning In Ascot…We Do Whatever It Takes! There is nothing worse than having as a feature a gorgeous, sparkling pool only to be obscured by fuzzy glass. The design of this beautiful 2 storey home with the pool right up alongside it really makes for innovative window cleaning methods. Just quietly, on this hot summer day our boys were actually quite happy to take a bit of a dip and carry out their professional window cleaning at the same time! When glass is this close to the pool – whether it is pool fencing or the house itself, it makes a huge difference if the glass cleaning is maintained because this will largely avoid ugly hard water stains appearing over time. This then becomes a major problem and requires polishing to remove, not to mention the expense. At Get It Clean we love a challenge and we enjoy exceeding our customers expectations… so you are delighted with the result. Call us now for a quote on 3268 4246 and we can talk you through the maintenance options to keep your property looking its sparkling best! https://getitclean.com.au/wp-content/uploads/2015/02/photo-4-e1424137576227.jpg 320 240 Get It Clean https://getitclean.com.au/wp-content/uploads/2013/07/get-it-clean-logo.png Get It Clean2015-01-05 09:45:042015-02-28 03:41:24Tricky Window Cleaning In Ascot...We Do Whatever It Takes! At Get It Clean we like to clean….not just houses, buildings, windows, hard outdoor surfaces but anything outside that needs a good makeover. Like the colourbond fence in the picture! This fence is an eye sore, and looking really dingy. Our professional cleaners water pressured this fence back to look like new again. So next time you are having your window cleaning professionally done, why not ask one of our cleaning specialists to give you some ideas on what else could be spruced up on your property to make it look its best. You’d be surprised what a difference it can make, improving the appearance and often the value of your property without the need of paying thousands for repainting. We can quickly and effectively remove grime and stains from paving/concrete, driveways, retaining walls, tennis courts, carparks, shopping centres to name a few. For a cost effective way to revitalise your outdoor areas call us on 3268 4246 and we’ll be happy to advise you on how to do it. Remember: Got It Dirty…. We’ll Get It Clean! Around Brisbane we see many buildings and homes with mould issues. You’ve probably heard of black mould but there are more than one hundred types of mould commonly found in and on homes, which can appear green, yellow, brown, grey or even white. It can be hard to identify mould by its appearance as it can vary due to many factors including the surface it is growing on. It is often found growing on the roof, eaves, and interior or exterior walls of buildings. But never in your fridge 😉 Not only can mould look unattractive, it can do a lot of damage to your property too. Mould comes from the family of fungi. Some diseases of animals and humans can be caused by ingesting or inhaling mould spores or toxic compounds produced by moulds. Some symptoms can be skin rashes or respiratory difficulties and it is best to consult a doctor in this case. For this reason, our professional building cleaners & house washing experts at Get It Clean have a specialised treatment plan for removing this unsightly problem from your property. Using PPE (Personal Protective Equipment) including gloves and mask we spray on our mould removal cleaning solution and scrub your building with brushes to remove mould and other building dirt and grime. We thoroughly rinse to restore your building or home to a ‘mould free’ state! Early intervention is definitely a key strategy when it comes to exterior building mould removal, and will save you money in the long run. Call Get It Clean now to rid your property of mould and free expert advice on how to deal with this unpleasant and unwelcome guest! Have you noticed piles of faecal material (like the one in the photo) around your building or home? If so then you probably have bats! You will notice also that the faeces may have a shiny speckled appearance (from all the insect wings) and will crumble like dust when touched. Guano is another term used for bat droppings. Bat guano carries fungal spores that cause Histoplasmosis which can be fatal to humans. Histoplasmosis is contracted as a result of inhaling faecal dust matter from the droppings. Bat guano must be handled similarly to asbestos since the threat of disease is high. Our professional building cleaners at Get It Clean have a very specific plan of action when it comes to removing the guano. Use appropriate PPE (Personal Protective Equipment), including a HEPA filter mask. Wet down the affected area with a specially made microban germicidal cleaner concentrate and allow it to break down the guano. Our building washing team will wash away all the matter and thoroughly rinse all affected surfaces to restore your building to a bat guano free building! Buildings where bats have resided in or around for years can suffer incredible damage from guano and urine left behind. The key to minimal damage is regular cleaning and maintenance. Get It Clean, Brisbane’s premier house washing and commercial building washing company, is happy to advise you if you have a problem like this or provide you with a quotation to have it removed. Spray on our custom made shutter cleaning detergent and leave it for 5 minutes to do its work. Brush and rinse thoroughly for an excellent result. To remove shot-gun algae we used white sponge treatment which brings the shutters up beautifully. To reinvigorate and get your shutters to sparkle like new call us now on 0404 802 530 and we can have a house washing specialist visit you for a quote.